It is a dark age for the Earth Federation. Our home planet is under attack and our colonies are raided unmercifully. Space travel has become a death wish as more and more enemy ships find their way past the outer defenses and into the paths of friendly trade. Supplies must go through, however, and as the pilot of the Federation fighter Threshold it is your mission to clear the tradeways of pirating fleets so that supplies may get to the defense bases that protect our world and its colonies from the lawless invaders that roam the galaxy. With 5 fighters at your disposal, destroy the many waves of enemy ships, using your hyperdrive to your advantage. But beware not to overheat your lasers or run out of fuel - the mothership can only supply you after you've defeated enough enemies! 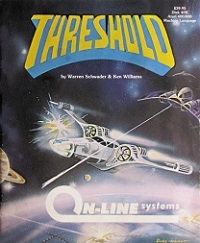 The game, designed by Warren Schwader and Ken Williams was first released in 1981 by On-Line Systems for the Apple II and Atari 400/800, followed by Commodore Vic 20, Commodore 64 and ColecoVision releases under Sierra's SierraVision brand in 1983.